Proven to last up to 2 years, JUVÉDERM VOLUMA™ XC is a uniquely formulated injectable gel designed to add volume and smoothness to the cheeks. Have you noticed volume loss in your cheeks? JUVÉDERM VOLUMA™ XC helps create younger and naturally full looking cheeks without any invasive procedures. JUVÉDERM VOLUMA XC injectable gel is the first and only filler FDA-approved to add volume to the cheek area instantly. It gives you a subtle lift, helping to restore contour and a more youthful profile, for up to 2 years, in patients over the age of 21. It’s different than JUVEDERM ® XC and works on a different area of the face. JUVÉDERM VOLUMA XC smoothes out moderate to severe wrinkles and folds around the nose and mouth, like parentheses. JUVÉDERM VOLUMA XC, however, adds volume to the cheek area. First and only Hyaluronic Acid filler that is FDA-approved to instantly add volume to the cheek area, resulting in a subtle lift. 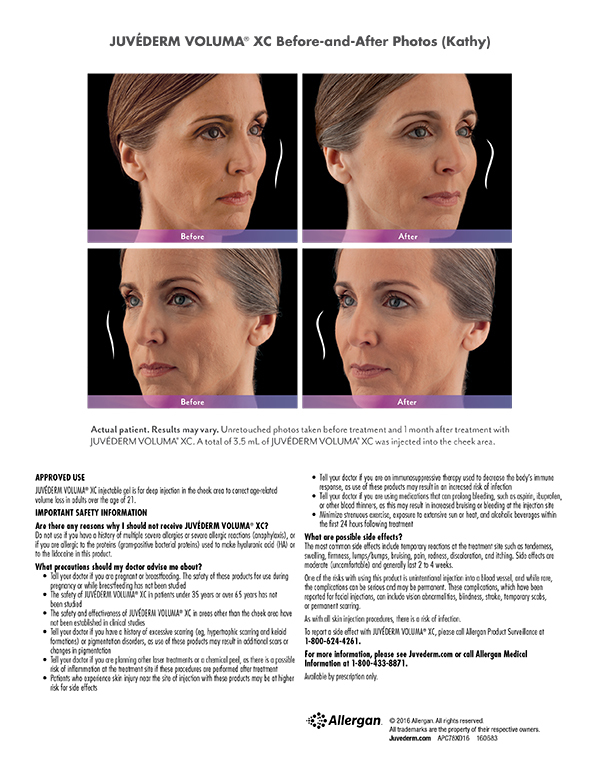 First and only filler FDA-approved for deep injection in the cheek area to correct age-related volume loss. JUVÉDERM VOLUMA XC is for patients over the age of 21.